CHARLES FRODSHAM & CO, NO 1532. 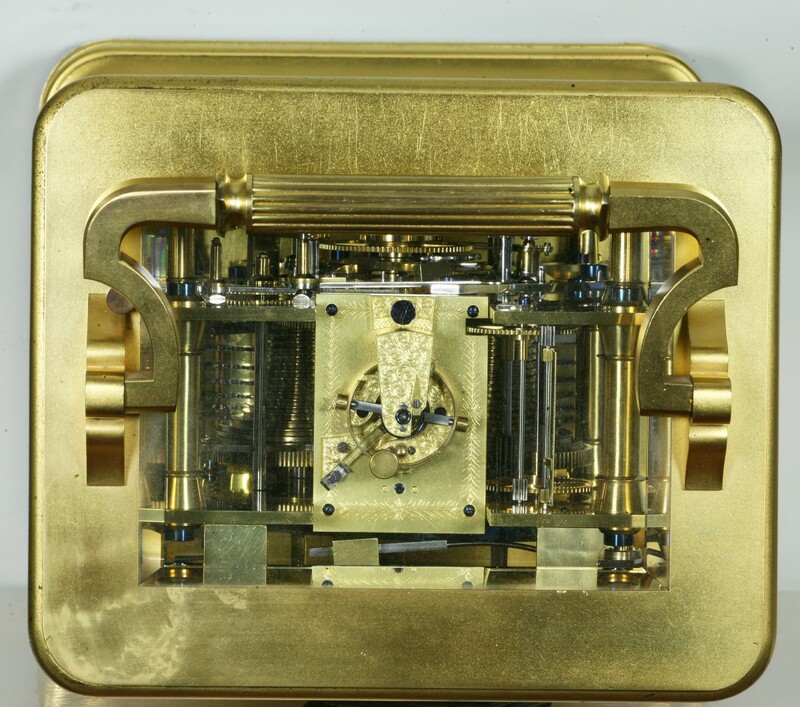 AN EXCEPTIONAL AND EXTREMELY LARGE GIANT CARRIAGE CLOCK WITH SPRING DETENT CHRONOMETER ESCAPEMENT. CIRCA 1890. 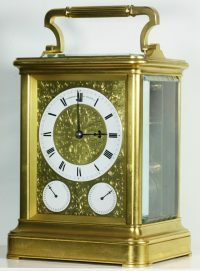 A quite exceptional and possibly unique enormous giant carriage clock. 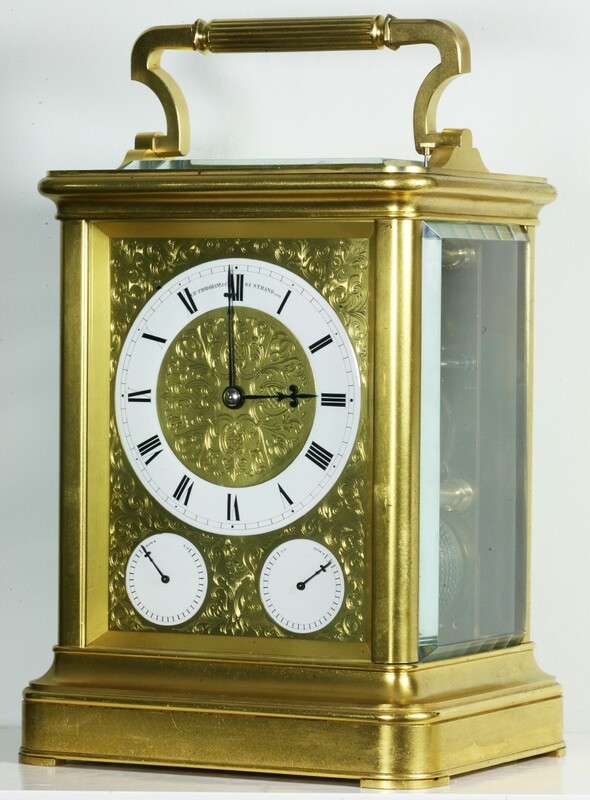 The case of similar style to many English carriage clocks by Frodsham and McCabe, but substantially larger, has a reeded centre to the carrying handle with deeply bevelled glass to the top, front and sides and a lift out rear door with shuttered apertures. 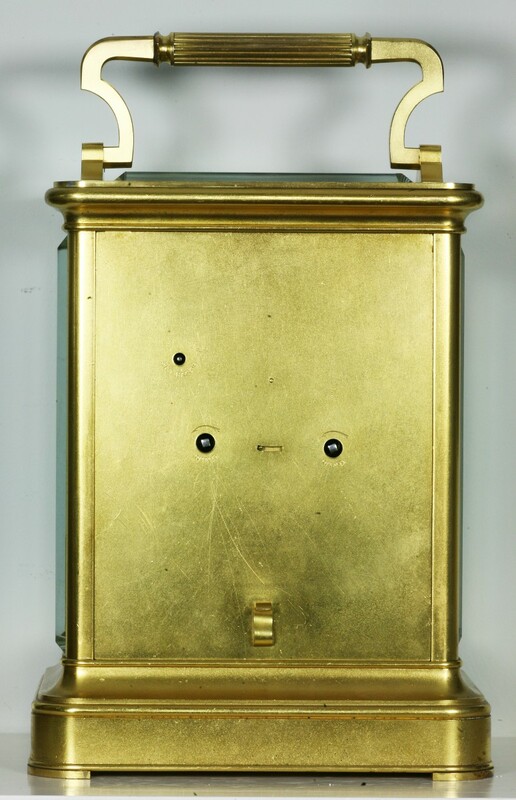 The dials of the clock are of white porcelain within an engraved gilded mask. 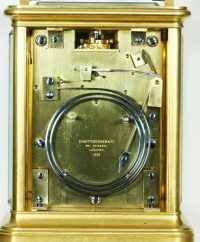 The main dial signed for the maker ‘Charles Frodsham & Co, 84 Strand, 1532’. The two subsidiary dials showing state of wind for the going and striking trains. 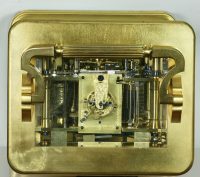 The eight day twin chain fusee movement has a superb spring detent chronometer escapement with a beautifully engraved platform. 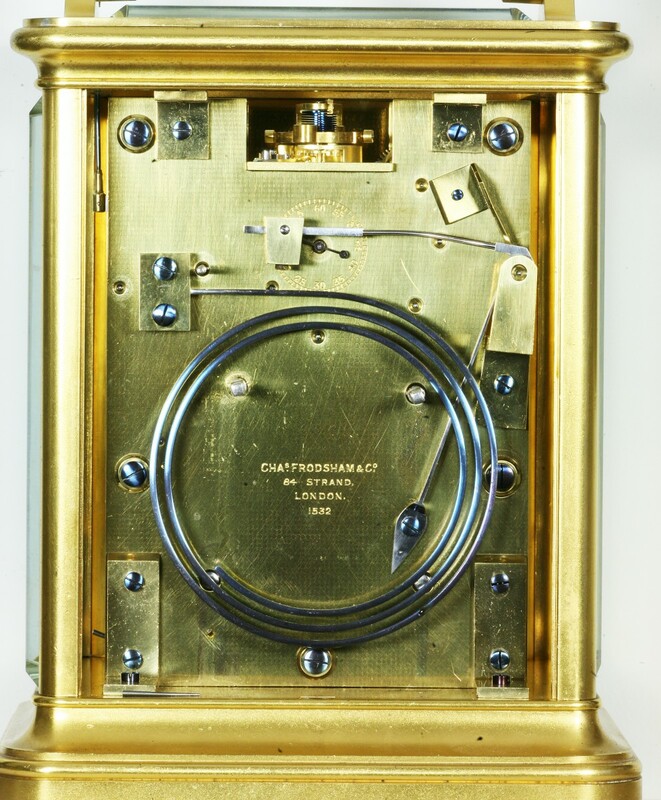 There is a seconds dial and hand on the backplate of the clock, a most unusual feature. 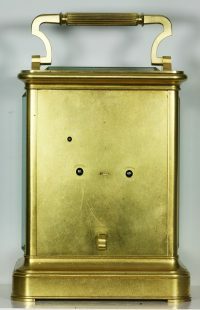 Unusually for an English carriage clock, it strikes the hours and the half hour on a gong mounted on the backplate. 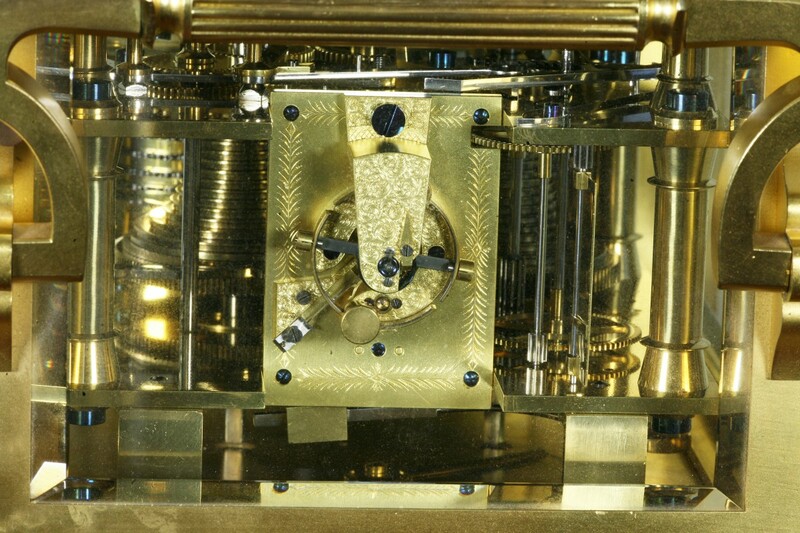 The clock has its original numbered key. 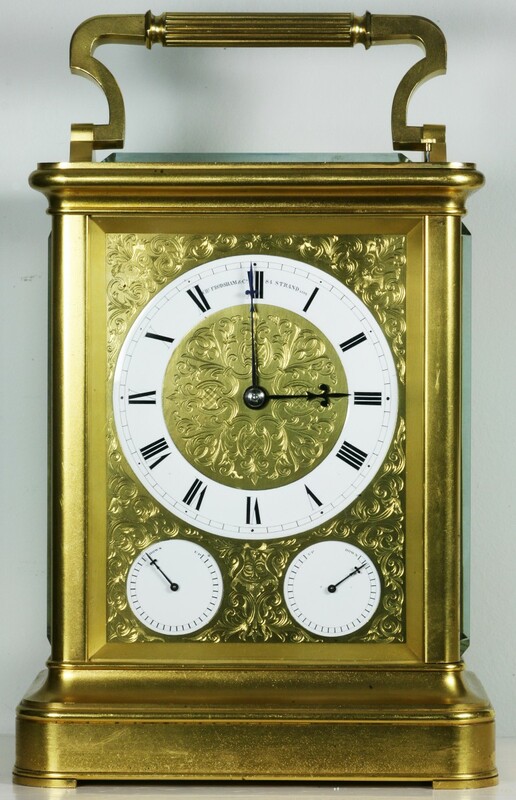 This clock was almost certainly a one off design ordered by a specific customer. 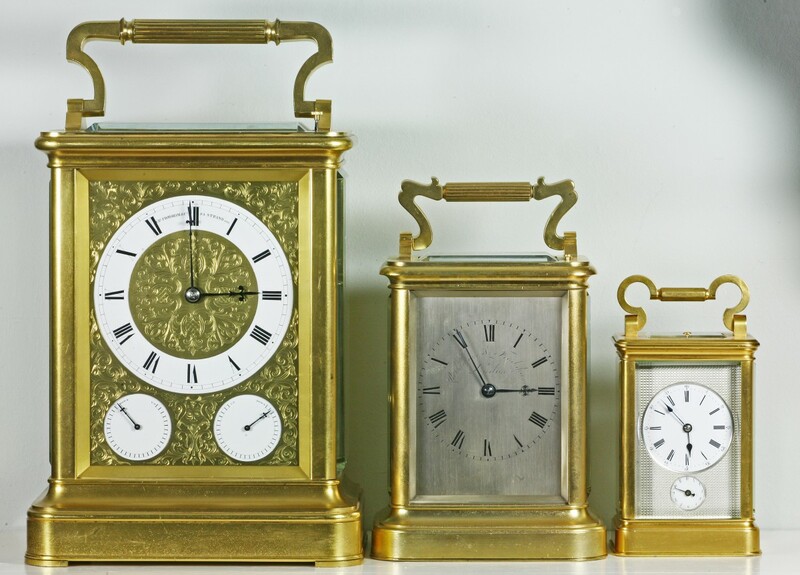 The Frodsham family is one of the most famous in English horology. It is also extremely complex. Charles’ father, William James Frodsham who was in partnership with William Parkinson at the beginning of the 19th century, had ten children, six of whom were to become watchmakers, the most important of whom was Charles Frodsham himself. Charles was born in 1810 and was apprenticed to his father for seven years. 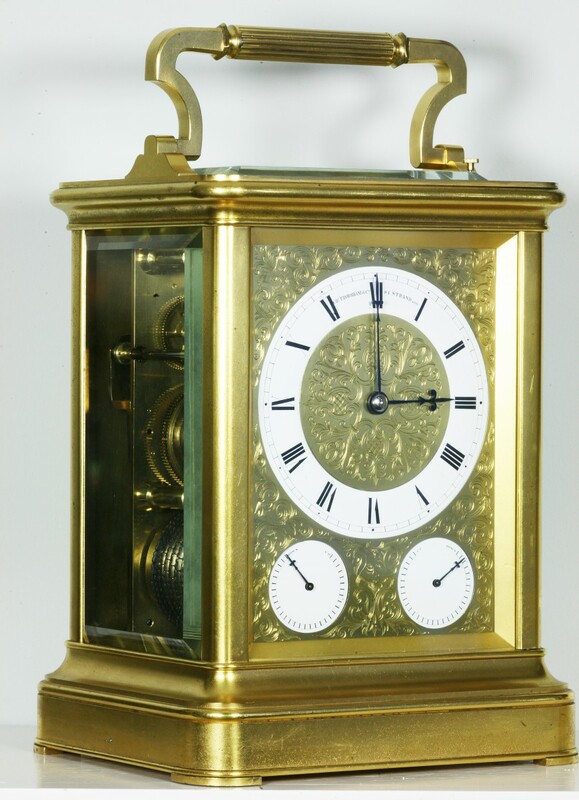 From a very early age it was obvious he had great skills and he submitted a chronometer for premium trials gaining second prize prior to having completed his apprenticeship. The business prospered and moved from various places starting with Change Alley and ending up at 115 New Bond Street. The move to New Bond Street took place in 1894 when 84 The Strand, their previous address, was pulled down to make way for a hotel. 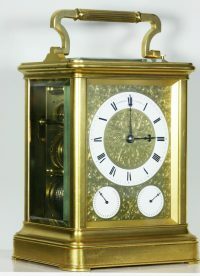 The firm was particularly noted for its chronometers and watches but also produced fine carriage clocks and a number of regulators. Further information can be found in ‘The Frodshams. The Story of a Family of Chronometer Makers’ by Vaudrey Mercer and ‘English Precision Pendulum Clocks’ by Derek Roberts pages 140-162.